Caution: if you're thinking this is plain old garden-variety coulrophobia--"I can't go to the circus 'cause I'm scared of clowns"--it's not. This, folks, is serious horror: the ugly underside of life where true evil hangs out. Probably not for the queasy of stomach, but this is one fascinating, unputdownable story. Part of Samhain Publishing's Horror "Childhood Fears" imprint, NIGHTMARE IN GREASEPAINT is indeed all about childhood--present and past--and its fears, real and imagined, and its very real dangers. It's also about depth psychology and abnormal psychology and metaphysics, and it is one enrapturing and unforgettable tale. Nick Cato of The Horror Fiction Review has a good review of L.L. 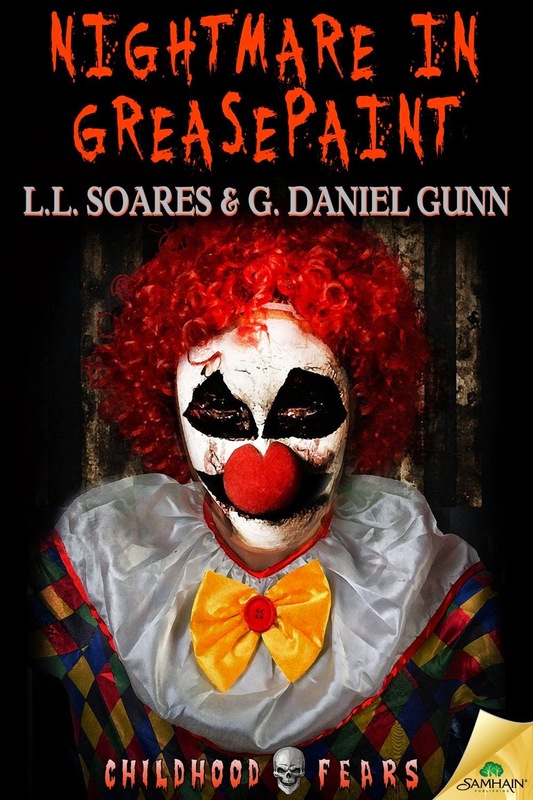 Soares' and my upcoming novella Nightmare in Greasepaint. Part of the "Childhood Fears" series of novellas, Samhain strikes with this quick but powerful tale that, while full of familiar horror tropes, manages to build some serious suspense and will easily freak out those who suffer from Coulrophobia. Clowns, dark basements, occult objects, dark family secrets and noises in the night may seem tiring to most horror fans, but Soares and Gunn take these classic elements and twist them into a satisfying, well done creep-fest. Nightmare In Greasepaint Available for Pre-Order! The new novella I wrote (as G. Daniel Gunn) with L.L. Soares (based on the very first short story I'd written a quarter century ago), Nightmare in Greasepaint, is now up for pre-order from Samhain Publishing. Available as e-book only for now - coming in October in print form as part of the Childhood Fears collection. At a great price, and a great scare! Clowns and horror. How can you go wrong? Pre-order now, it'll look really good.